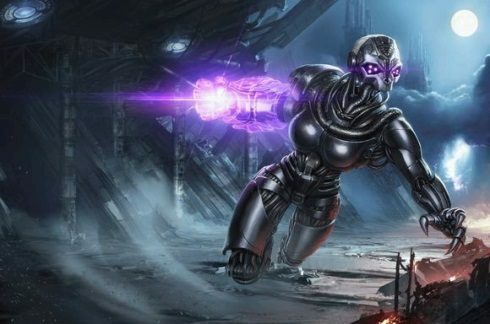 Science fiction-themed MOBA Shards of War has added a brand-new character to their roster of warriors, the formerly-human machine named Vox. After the war ends, she goes on to a successful career posing for Aerosmith album covers. Vox is a pretty creepy character to look at, but even moreso once you delve into the back story of her character. Formerly a human herself, Vox is from an alternate dimension where, in the great battle between man and machine, the machines have won. Little is left of the person Vox once was: now she is little more than another automaton, working to spread the dominion of machines beyond her own dimension, one infection at a time if necessary…. Vox makes the 11th character to join the roster of Bigpoint‘s MOBA Shards of War, and in-game functions using a combination of tanking and almost vampiric abilities, allowing her to actually regain health based on how much damage she deals to her opponents. When she reaches higher levels she can even access abilities that allow her to control the flow of battle on the field, with barriers that will drain the health of her opponents just by coming into contact with them, making her a formidable opponent and an asset to any team. Shards of War, which brags of being the first science fiction themed MOBA on the market, is a newcomer to the genre, but has been receiving middling to positive response from critics, with some claiming that the game’s use of WASD-based shooter-style controls makes the game more accessible to players not used to the typically mouse-driven interface used by most other MOBAs. Like the rest of the games in Bigpoint’s library, it is part of the “free to play” market, utilizing micro-transactions in place of a classic purchase model to drive profit.